When Alex Grebe signed up for term life insurance, he lied. The 28-year-old stated that he is tobacco-free. "I know not to tell insurers the truth," said the Manhattan resident, who smokes cigarettes. Grebe only pays $50 a month for his term life insurance, but had he revealed he was a smoker, he would have paid more than three times as much as a non-smoker for the same policy, according to a new InsuranceQuotes.com report. A 45-year-old nonsmoking woman pays $544 per year for a term life policy with half million in coverage for 20 years but with a smoking habit, her rate goes up 269 percent or $2,600 a year. 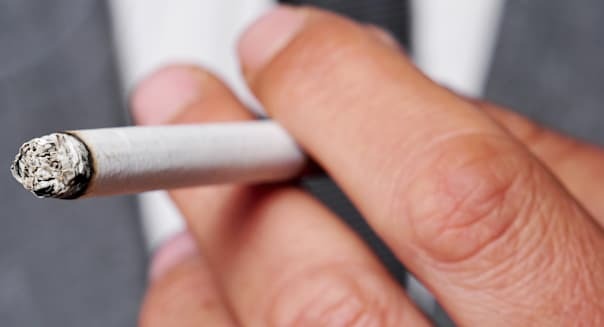 "Smoking causes one in five deaths in the U.S. and has been linked to many diseases like diabetes, lung and heart disease which are the three health issues that we know about," said Laura Adams, senior analyst with InsuranceQuotes.com. "This is something insurers watch closely." Of course it's hard for insurers to know when people like Grebe lie about their smoking habit. "I named my younger brother as the beneficiary," he said. "He needs the money." Will the Insurance Company Find Out? Chances of an insurer inquiring about a death are low unless it's suspicious. "Insurers wouldn't have a reason to know a policy holder smokes unless they investigate," Adams said. "This only happens when there's a question about the death or if the policy is worth more than $1 million." One way an insurer could determine whether a smoker is fibbing is by requiring an annual physical. "But that would be up front," said Adams. "It's not something they can surprise you with." Blood work that could detect nicotine is typically not mandatory for term life policies, which can be part of a policy's appeal. "Insurers are probably charging higher rates to adjust for the risk that an applicant is lying when they approve you without a physical. It's a gamble that the insurers are aware of," said Adams. "Insurers create statistical models that forecast how long an applicant is likely to live." Regardless of whether an applicant smokes or not, insurance rates rise as people age. A 35-year-old pays 27 percent more than a 25-year-old for the same coverage, and 45-year-olds pay 120 percent more than 35-year-olds. "You can save a lot of money by getting life insurance while you're young," Adams said. "By locking in a level-term policy in your 20s or early 30s, you will benefit from much lower rates while protecting your loved ones for decades to come."